Does Starcraft need any introduction? This supremely popular real time strategy game is still played professionally in countries like Korea, where e-sports have reached mainstream levels of popularity. Although its popularity has waned a little since Starcraft 2 was launched, classic Starcraft is still loved by millions of players. What’s more, it can be purchased very cheaply and, unlike the more restrictive sequel, played on even older computers throughout the house. A perfect game to keep bored teenagers occupied over the summer holidays! Like many classic titles, Starcraft has now been remastered and updated for modern PCs. Starcraft Remastered fixes all the problems with the original game on modern hardware, supports fluid full screen modes, updates the graphics without changing the original look and feel and is just generally an all round great remaster. It’s definitely our favourite way to play Starcraft on a modern PC, check it out here. 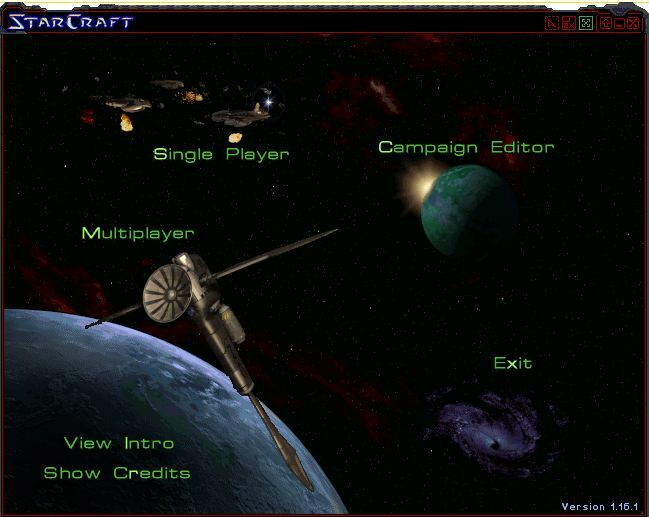 You may still want to play and install the original, classic version of Starcraft, just to see how things used to look, or to use some of the many user created level packs etc. If you do want to install classic Starcraft, then follow our guide below. Classic Starcraft is now free! Can’t find your original Starcraft CD-ROM from back in the day? Worry not, you can now download and play classic Starcraft entirely for free! Blizzard have very generously decided to give the classic game away for free to everyone. To download it, visit the page here and then scroll down untill you find the section titled “Features”. Underneath this there should be a “Play for free” link. Click this and the Starcraft installer will download. Once it’s downloaded simply run it to start the installation process. Since this free downloadable version will keep itself patched and updated, we recommend using this download even if you have an original copy of the game on optical media. Starcraft will install just fine on modern versions of Windows, no special steps need to be taken. There are two options for running the game that we will cover here. The first allows the game to be played full screen. In this mode, the game will run at a fixed resolution of 640×480. Since the game runs in this low resolution, it may look somewhat blocky on a modern monitor in full screen and it will have borders around the sides on a widescreen monitor. Like several other older games, Starcraft will run with incorrect colours unless Windows Explorer is disabled before the game runs. To do this, we prepared this simple batch file that disables Windows Explorer (the entire Windows Explorer, including the Start Menu and taskbar) before launching Starcraft. Simply drop the script into your Starcraft installation folder and then double click to run it. You can download the batch script here. Our hosts have now started demanding we store all batch files inside zip archives, so you will need to download the zip and extract the batch file from inside it. Dual monitor users should disable their secondary monitor before attempting to launch Starcraft in full screen mode. The second option for running the game is to use the program “ChaosLauncher”. 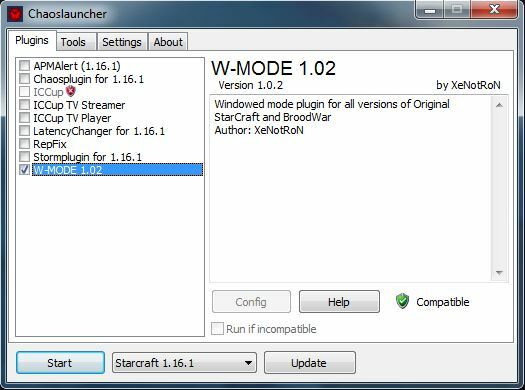 This is a specially designed program that adds extra features to Starcraft, including a Windowed mode that many users prefer on modern monitors, as well as other fixes for multiplayer games. You can download ChaosLauncher here. ChaosLauncher is downloaded as a zipped folder, you should open this folder and copy all the contents into a separate directory (not your Starcraft directory). Once that’s done, open the folder you extracted the files to and double click on the “ChaosLauncher” or “ChaosLauncher.exe” file. The picture below shows the program running. To get the most out of the game in Window mode, there are a couple of settings you should be aware of, they can be set by clicking the icons in the top right of the window. Locks the mouse pointer to the window. This prevents you from moving your mouse outside of the window during gameplay. This improves playability significantly. To unlock the mouse pointer again, press the Windows key on your keyboard. Scales the graphics to twice their original size. This makes for a much bigger and better looking window without over-scaling the graphics and making them look blocky. Playing this way is the preferred way to play Starcraft on modern PC’s and monitors for many players. The Battle.net service that hosts multiplayer games for Starcraft over the internet is still running. Starcraft uses the “classic” Battle.net service which means it uses a different set of credentials from the current Battle.net service used for games like Starcraft 2 and World of Warcraft. We connected to the service and it told us that thousands of games of Starcraft were still being played, though we could only find one public game. Of course, you can set up your own private games with your friends and play them over the internet using the Battle.net service, it’s free too. Remember that players you meet online are likely to be highly skilled, so don’t be surprised if you’re facing defeat rather quickly! 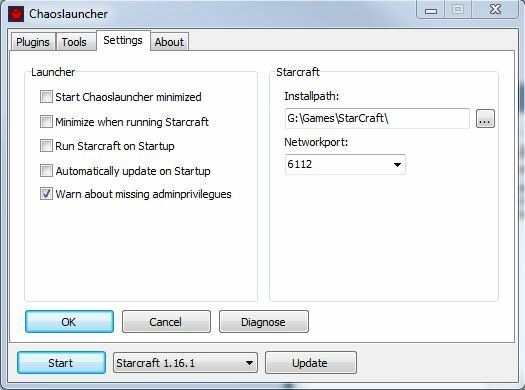 If you have several internet connected PC’s in the house, you can use the Local Area Network (UDP) option to play Starcraft against guests or other family members. You can legally install Starcraft on several PC’s in your house, the additional copies will work for Local Area Network play only. Playing over the LAN makes for some fantastic, fast and lag free multiplayer experiences. Since Starcraft only needs a modest spec PC, it can be played on laptops or even the old machine in the attic. All you need is a network card and a connection to your home internet connection, wired or wireless.